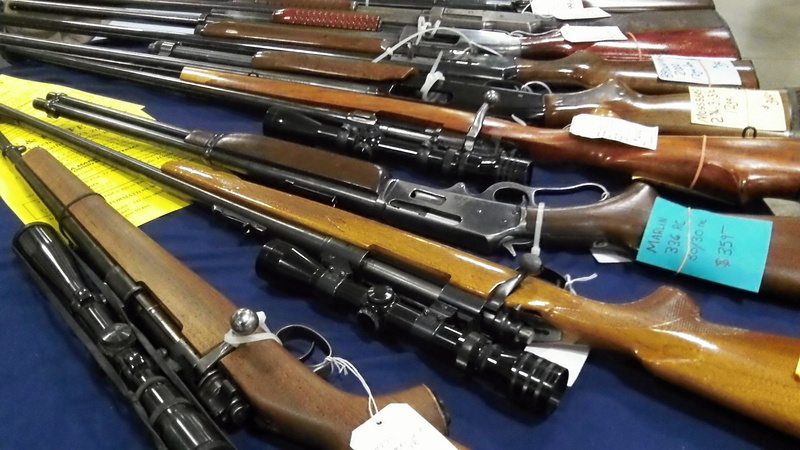 Rifles on display at an Albany gun show in March 2014. Not that it’s a big surprise, but the three Linn County commissioners have gone on record supporting the right of law-abiding people to keep and bear arms as the Second Amendment guarantees. Commissioners Roger Nyquist, John Lindsey and Will Tucker signed a resolution to that effect on Tuesday. Linn County Sheriff Bruce Riley also signed the resolution, indicating he supported its content. Among other things, the commissioners say they oppose any state or federal law contrary to the state or federal constitutional provisions preserving the people’s right to keep and bear arms. They also say the board “vigorously opposes” any law that unconstitutionally restricts those rights. And the resolution concludes that the board “remains committed to the removal of firearms” from those who have forfeited their rights because they have committed felonies, or from people who have been judged mentally ill and a danger to themselves and others. The Clackamas County commissioners adopted a similar resolution on Feb 19. Before that, nine county governing boards — out of Oregon’s 36 — had done the same: Lake, Baker, Wallowa, Yamhill, Klamath, Polk, Douglas, Wheeler and Sherman. If you’re wondering whether Benton County might be next, I wouldn’t hold me breath. How does anyone here propose to keep guns “from those who have forfeited their rights … or … judged mentally ill and a danger …” without near-universal background checks (in addition to other means)? I assume the resolutions are mostly an R thing and expanded background checks are mostly a D thing. I loudly applaud this resolution. I am a liberal independent who voted for Obama twice. Support for or against the 2nd amendment, just like other controversial issues such as the death penalty, or abortion, is no litmus test for whether one is a D or an R or something else. Perhaps not a litmus test, but you won’t find much support for your 2nd Amendment beliefs among your fellow Dems. Just saying…..
One question: If you so value your 2nd Amendment rights, why did you vote for our “Emperor in Chief” (Obama)? You do know he is very (almost silently) quietly subverting those rights in ways you can’t imagine, don’t you? Tried to buy any ammo lately? Reloading components? Pretty short supply compared to the GWB days and before. Short supply because of fear mongering. Good for business. Nice try, Howling Cicada…whatever that is. The feds are buying up ammo at an alarming, unprecedented rate, creating these current shortages. Fear mongering? We have plenty to fear and Obama is at the top of the list. It’s clear we can’t count on him for ANYTHING except unconstitutional edicts. Sorry, I meant to say “your fellow liberal/progressives” above. I apologize for calling you a Democrat. The same way drug laws keep illegal drugs out of the hands of the citizens. IOW, IF someone wants to break the law, they’ll break the law. The gun laws proposed don’t address any problems that existing laws don’t cover. Those who currently circumvent any of our laws will continue to do so.